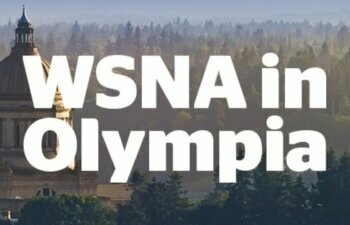 The past president of Nursing Students of Washington State has advocated for patients at WSNA’s Nurse Legislative Day and has accepted a job at Kadlec Regional Medical Center in Richland. Adam Halvorsen knows that providing the best possible patient care is crucial in the health field, which is why he is using his degree in nursing from Washington State University Tri-Cities to advocate for better care for patients and for his nursing colleagues across the state. Halvorsen got involved in advocating for nursing policy as a student at WSU Tri-Cities. Little did he know his efforts would lead him to become the WSU College of Nursing Outstanding Undergraduate Student this fall. Halvorsen’s passion for service grew out of his start in the military. The day after 9/11, he signed up for the U.S. Marine Corps and spent four years active-duty with time in Okinawa, Japan, as well as through a tour in Iraq. After he left the armed forces, Halvorsen continued his career in service in two jobs: as an emergency management technician for Medstar Ambulance and as a firefighter for the Gallup Fire Department in Gallup, New Mexico. He enjoyed those roles, he said, but he wanted to be a part of the long-term care and recuperation of his patients, rather than just being a part of their initial care in his emergency care roles. He enrolled in the WSU Tri-Cities nursing program, which is where he was introduced to opportunities that would allow him to use his passion to better nursing and patient care for Washington state. 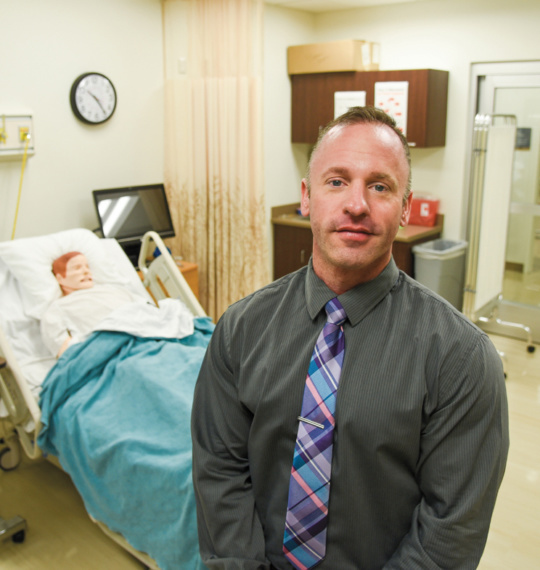 In addition to the hands-on training he received from his experienced professors and instructors in the WSU Tri-Cities nursing program, Halvorsen received the opportunity to take on leadership roles within several state nursing organizations. He served as president of Nursing Students of Washington State. His experience at WSU also led him to serve as part of the Washington State Nurses Association, as well as attend a national conference through the National Student Nurses’ Association. Through these affiliations, Halvorsen had the opportunity to provide input on association policy, expand communication efforts through video, as well as generally advocate for his peers and future colleagues in nursing. 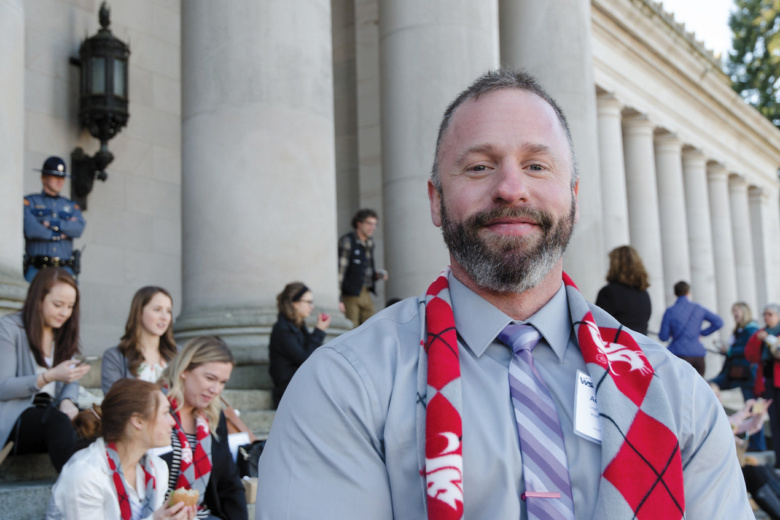 Last year, Halvorsen also joined his WSU peers to represent WSU at Nursing Day at the Capitol in Olympia, which allowed him to interact with prominent government figures to advocate for patient care and speak publicly about the importance of nursing education and the nursing profession. Halvorsen said he hadn’t initially planned on getting involved with these types of leadership roles or that it would lead him earning the WSU College of Nursing Outstanding Undergraduate Student award. “I honestly didn’t expect it, but I’m honored to represent my incredible peers for the work we have accomplished together,” he said. Halvorsen said the primary reason behind his activism in the nursing field is that he is able to have a positive impact, not only on the current state of health care, but also its future. After graduating this fall, Halvorsen now has the opportunity to exude even more leadership through his role as a director for the National Student Nurses Association where he is also head of the ethics and governance committee for the organization. Additionally, he has accepted a position as a full-time nurse in the cardiac department of the Kadlec Regional Medical Center. After spending a few years as a full-time nurse, he plans to obtain his doctorate of nursing practice. He hopes to use his career experience and academic credentials to continue with advocacy work and volunteer opportunities. His long-term goal is to work with the American Nursing Association to develop and refine nursing policy. Halvorsen said he couldn’t have accomplished his feats without the mentorship he received from the the nurses at WSU, WSNA and those within the NSNA. “Their guidance and leadership has taught me so much that I will continue to use throughout the rest of my career,” he said. This article is reprinted with permission of the Washington State University College of Nursing.